Pam Skadins was born in Brisbane, and has worked as an early childhood teacher for many years. 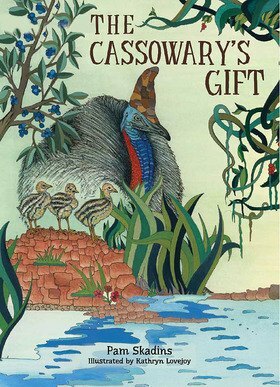 She was inspired to write her first children’s picture book, The Cassowary’s Gift, following a trip to the Daintree region in North Queensland in 2012. While she was there, she learned about the endangered status of the cassowary, and how the threats to the bird are ongoing. Through the book and accompanying song, she has sought to build on young children’s natural curiosity and wonder, to help them understand the importance of the cassowary in the rainforest ecosystem. Besides an interest in the natural world, Pam enjoys reading and travel. She has two daughters.